The new MFC-J4620DW sits in the middle of Brother's small/home office range, delivering A3 printing and A4 scanning, copying and faxing. It also has the ability to connect directly to a range of cloud-based services such as OneDrive and Dropbox and to a wide range of mobile devices such as smartphones and tablets. The suggested retail price is £159 ex VAT (£190.80 including VAT, which is around $280 or AU$370). 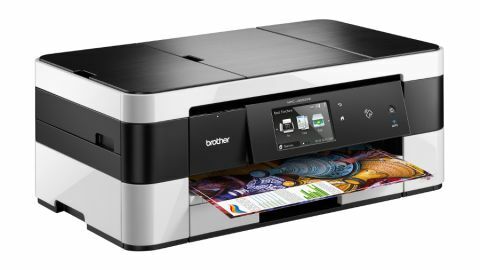 Brother makes a lot of printers, and at first glance the specification of the MFC-J4620DW looks very similar to the identically priced MFC-J5320DW business inkjet. However, there are differences. The MFC-J4620DW offers a bigger touchscreen, more connection options and double-sided scanning, and it lacks some wired networking features: its sibling supports APOP, SMTP-AUTH and SSL/TLS over wired networks but this printer doesn't. The MFC-J4620DW is more compact and lighter than many of its stable mates, with a 9.5kg weight and a footprint of 480mm wide, 290mm deep and 188mm high. It isn't a bad looking thing either, with a mix of ivory and black that makes the MFC-J4620DW look less bulky than its rather utilitarian-looking peers. The tilting touchscreen is 9.3cm, which is bigger and more comfortable than some of Brother's other printers, but the on-board RAM is just 128MB compared to the 256MB that you'll find in Brother's higher-end models. Scanning resolution depends on how you feed it. If you use the flatbed you'll get an optical resolution of up to 2,400 x 2,400 dpi, but if you use the automatic document feeder the resolution is 2,400 x 1,200. Interpolation takes the resolution to an effective 19,200 x 19,200 dpi. You can scan directly to email, USB drives and on Windows networks, email and web servers (although you'll need to download additional free software for that). The main paper tray takes 150 sheets, the ADF 20 sheets, and the manual feed 1 sheet. The output tray holds 50 sheets. Printing goes up to 6,000 x 1,200 dpi with speeds of up to 35ppm in mono and 27ppm in colour; for laser comparable quality (ISO images per minute) you're looking at a still-respectable 22ipm in mono and 20ipm in colour. There's automatic two-sided printing and also two-sided copying, albeit at lower print quality: that's up to 1,200 x 2400dpi (12ipm and 9ipm respectively). As with Brother's other business inkjets there are multiple options here. The fastest mode sacrifices quality for sheer speed and is perfectly adequate for internal documents, but when you need to impress you can whack up the quality settings to deliver crisp colour on A4 and A3. Print speeds are always "up to" but in our tests we achieved very similar speeds to the manufacturer's claimed speeds. Naturally, the higher the quality and the bigger the paper the longer printing takes, so for example a single photograph on A4 (in plain paper mode) took just under two minutes, and on A3 the time was just under six minutes. If you're planning to print a lot of colour material it's worth investing in decent quality paper, as poor quality copy paper can suffer from oversaturation on darker images. We found the quality of photographs to be a little on the light side, but that isn't likely to be an issue for the average business environment. Inkjets often fall down on their running costs, but the MFC-J4620DW isn't too bad. For this model, Brother offers two kinds of inkjet cartridges: standard yield cartridges that deliver approximately 550 A4 pages each, and high yield cartridges that deliver approximately 1,200 pages. A multipack containing a high yield black cartridge and a set of three high yield colour cartridges is currently £41 (around $60, AU$80) plus VAT, which works out as 3.4p per page for CMYK printing, and a single high yield black cartridge is currently £14 (around $20, AU$27) plus VAT, which is 1.1p per page. As ever, that's based on 5% ink coverage on A4.